The Immortal Hulk Volume 1: Or Is He Both? 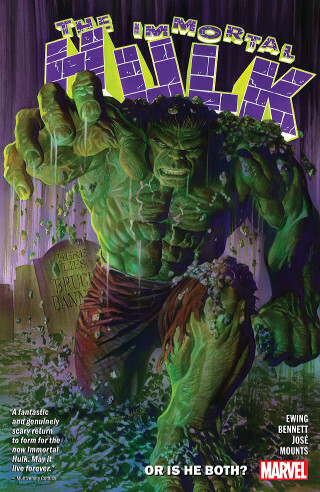 The third issue included in The Immortal Hulk Volume 1: Or Is He Both? 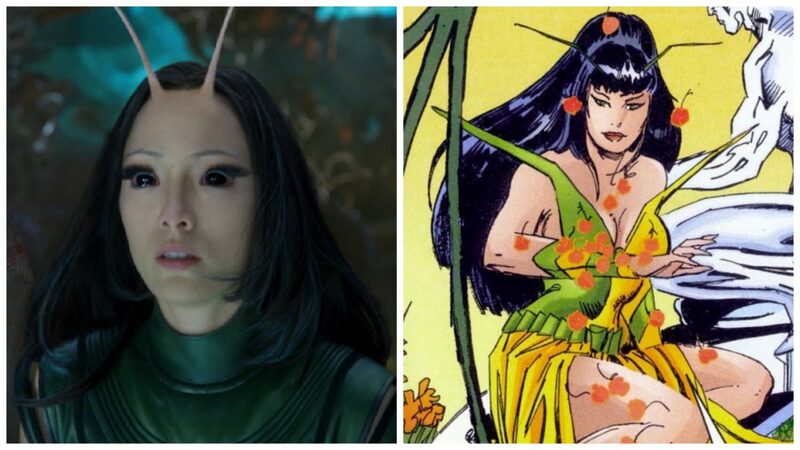 pits the green-skinned antihero against long-time antagonist Hotshot. 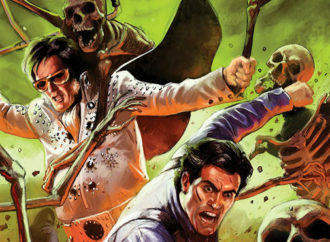 But this is not a typical superdude showdown, as writer Al Ewing tells the story in Rashomon fashion, with a group of witnesses—a cop, a bartender, a priest and an elderly woman —each recounting their version of events. The comic uses different artistic styles to illustrate the different perspectives: the cop imagines himself as a square-jawed hero right out of classic Jack Kirby; the pearl-necklaced senior recalls Hotshot as a pastel-toned James Dean lookalike filtered through 1950s romance comics; the bartender’s flashback draws upon the Ghost World school of indie comics; and the priest’s tale is the stuff of Gothic horror. Coming halfway through the trade paperback collection, these nested stories sum up Al Ewing’s approach to the title character. 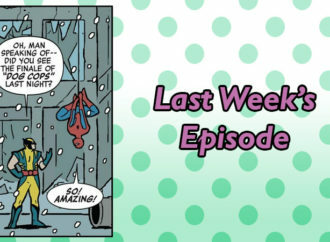 The point of The Immortal Hulk is not so much the plot, which is a fairly routine runaround for the character, but rather the variety of different angles taken by Ewing as he shows us the Hulk’s latest exploits. The first issue has Bruce Banner witnessing a convenience store shooting, transforming into the Hulk, and eventually tracking down the killer. 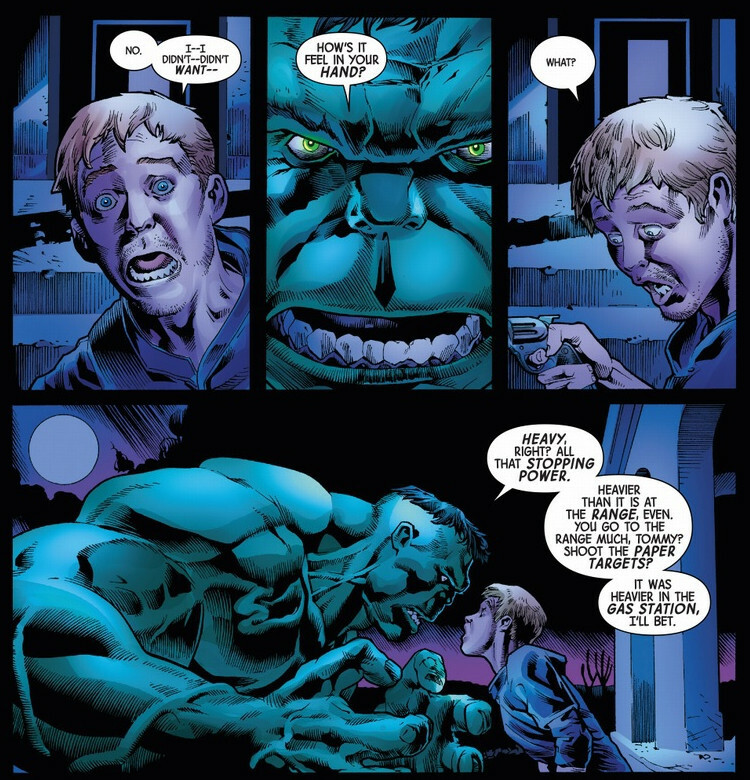 Ewing stages this as a horror story, keeping both Banner and the Hulk as shadowy background presences and playing up the confusion and terror of the secondary characters. 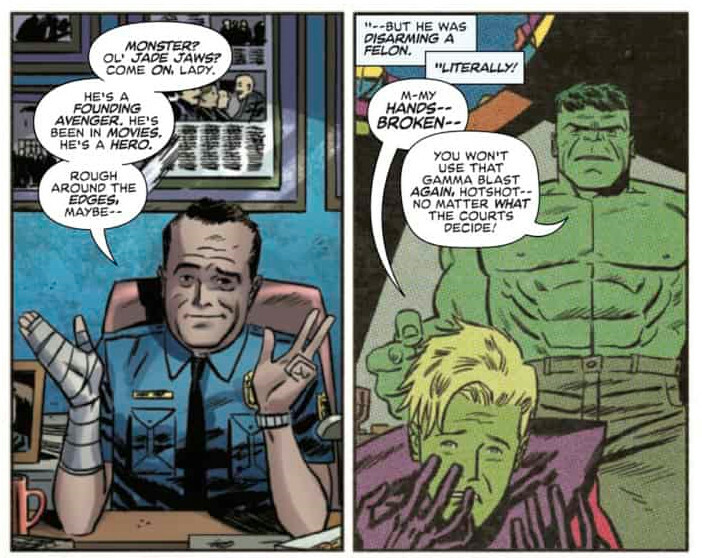 Before he is even identified by name, Banner is shot during the store attack and presumably killed; he does not transform into the Hulk until he is in the morgue, when we see the exposed arm of his shrouded body turning green (as befits a horror-oriented treatment of the Hulk, the comic returns to the original idea that he transforms at night). The shooter is later re-introduced as a partly sympathetic character: a frightened young man, intimidated by a criminal gang, tears in his eyes as he recounts the homicides he committed upon panicking at the store. It is easy to imagine him being transplanted into a slasher film, as yet another frightened youngster who has broken the rules and will be duly punished by Jason Voorhees or some other superhuman brute. Sure enough, the gang members split up to investigate a noise outside, and the young shooter is left face-to-face with the Hulk. The first issue’s melding of superhero and slasher villain has a certain genre logic. After all, the classic EC horror comics of the 1950s were frequently tales of crime and (gruesome) punishment, and the Marvel monster comics of the following decade—including Hulk—drew upon some of the same traditions. Having first placed the Hulk against a backdrop of gritty, angst-ridden crime drama, Ewing plays up the more colourful side of horror comics in the second issue, where Banner takes down a scientist who has turned himself into a glowing, gamma-irradiated killing machine. But for all his monstrousness, the Hulk belongs ultimately to the superhero pantheon. And so The Immortal Hulk, after cycling through the crime, slasher, Gothic horror and even romance genres, settles into cape-and-tight territory by picking Walter “Sasquatch” Langkowski—of the superhero team Alpha Flight—as its main rival to Bruce Banner. 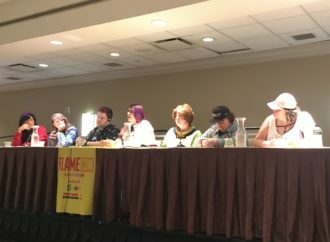 Investigative journalist Jackie McGee, who has been tailing Banner throughout the series, approaches Langkowski on the grounds that he was Banner’s college roommate before turning himself into the furry Hulk-like Sasquatch. 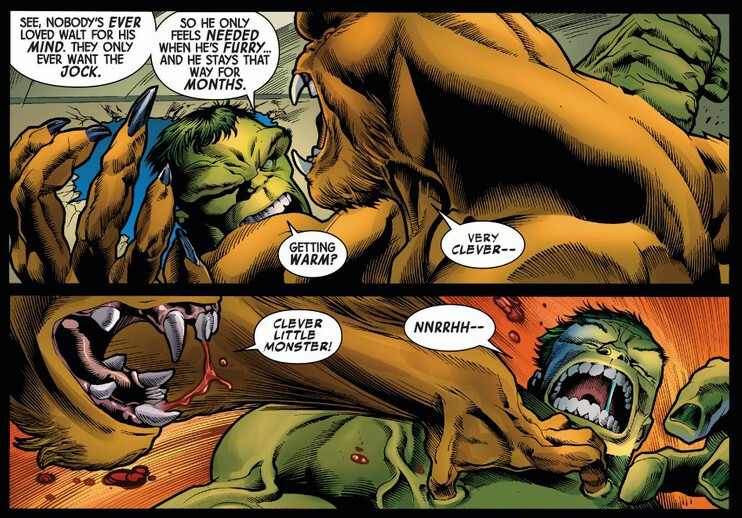 In casting Sasquatch as Hulk’s adversary for the climax to its first story arc, the comic draws upon that age-old rivalry between the jock and the nerd. Across the comic, Ewing plays up Banner’s smarts. Even in his monstrous green guise, the protagonist has the brain of a nuclear physicist. By contrast, Langkowski/Sasquatch spent his college days playing football; although he was interested in learning more, the young Banner dismissed his goal: “You’re a jock! A half-smart jock, a jock with ambitions, but a jock is what you are!” Now, with Hulk on the run, Sasquatch can settle this old rivalry. 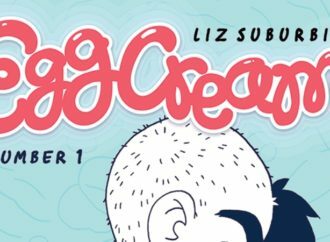 But even as the final showdown between these bulked-up US college archetypes plays out, the comic is preparing one more genre-shuffle. While he fights Sasquatch, Bruce Banner is forced to confront another adversary from his past—in fact, one who is no longer living. 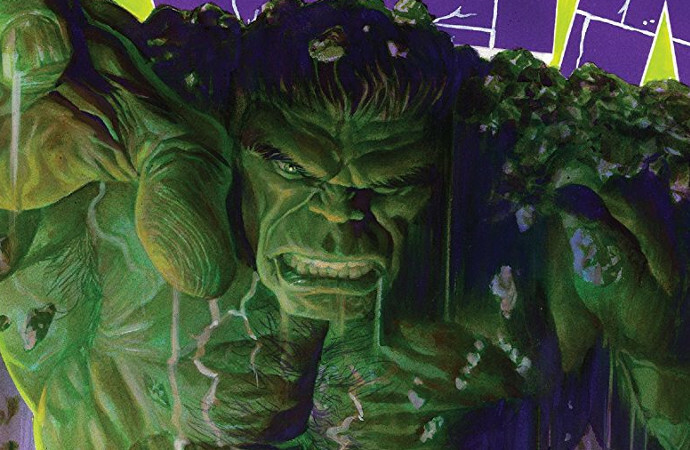 Just in time for the next volume, The Immortal Hulk has become a ghost story. The Immortal Hulk Volume 1: Or Is He Both? 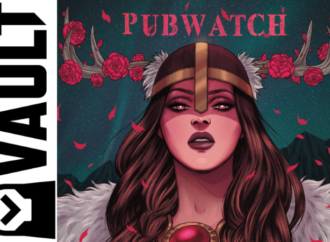 is drawn primarily by penciller Joe Bennett, inker Ruy Hosé and colourist Paul Mounts, with guest artists Paul Hornschemeier, Marguerite Sauvage and Garry Brown illustrating the flashbacks in issue #3. 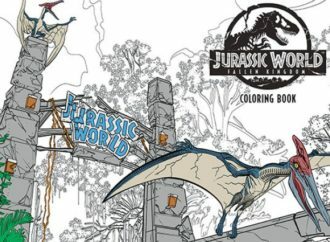 Bennett’s pencils have more than a touch of EC horror about it, showing a distinct fondness for distorted monsters, screaming faces and other grotesque exaggerations and caricatures all build upon a solid base of draftsmanship. Like the EC classics, The Immortal Hulk depicts a world that the reader can believe in, despite the fantastic underpinnings. He succeeds—and he succeeds through a balancing act. The Immortal Hulk Volume 1: Or Is He Both? 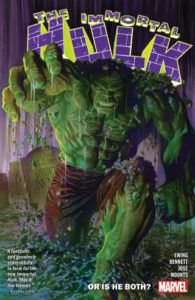 balances a fresh take on the Hulk with fidelity to his past appearances; it balances grittiness and angst with wry humour and a celebration of comic-book absurdity; and above all, it balances several distinct ideas of exactly what a Hulk comic can be. The Hulk is a character who lends himself to simple-minded smash-fests, but as Al Ewing demonstrates, his exploits can be more thoughtful than that. Perhaps the biggest achievement of The Immortal Hulk is that it manages to work on both levels.